So according to PIOMAS , the ice volume and thickness (and therefore area) are at the beginning of March almost the same as in 2012. And still a month to grow even thicker. Well it looks like the ice cracks had a big effect, but in the opposite direction many people were predicting. The previous record for volume gain through March 1st was 16.4. We are at 16.7 now. It is fairly likely we will break or tie the record for volume gain this year. We will see if the cracks result in a record volume loss as well but I am skeptical. The cracks are far from the fram strait and will have time to refreeze. Volume doesn't peak until sometime in April. I am going to predict a recovery year, with an expected value for volume minimum close to last years number. So volume also almost same as 2011 as well as 2012. One reason for growing thicker faster is heat can be lost faster through thinner ice. If the ice has caught up in thickness that reason disappears. So is any further thickening relative to 2012 likely to be a result of less snow cover? If so, the lower snow cover might mean lower albedo and a faster start to the melt season? The frozen over cracks certainly look like they have lower albedo. Got a feeling there was a diagram showing evolution of ice thickness and snow thickness after instantaneous removal of sea ice in Schroder and Connolley 2007 but I am struggling to find it now. Attached is a graph of PIOMAS ice gains (max.volume - min.volume.previous.year). It shows, as most people here are aware, that volume gains are on the increase. Record gains should be quite normal, and are entirely expected because of the record low September ice. Record gain straight after record loss isn't at all unexpected - it's well-known that there is less of a downward trend in winter than in summer, and that the annual cycle is getting gradually wider. Staying at the same volume as the all time record low is not a recovery! If the volume is the same, then any recovery in area/extent just means the ice is thinner. Note that for 2007 -> 2008, there was a reasonable if short-lived "bounce back" in summer minimum extent. However, that time round, 2008 was well ahead of 2007 even by the end of January. The fact that we're not substantially above 2012 by now suggests we're unlikely to see much of a "bounce back" from last year's record low, and may be close to a second record in two years. How is that a recovery? How did you fit that trend line on the annual gain plot? The data are very scattered. What I meant to say was that it is looking like there will be a deviation from the volume loss trend in a positive direction. Based on various trend lines volume could be expected to range from 2.0 to 2.7. It's looking like ice volume will significantly deviate from these trends. I guess I could have been more precise. As always thanks so much for your work! I'm planning on stealing a few of your graphics for a presentation I'll be doing in early May - with proper accreditation and your consent of course. It would be nice if PIOMAS linked to your graphics page as you've managed to tease out so much more from their data than they're able or willing to share. I wonder how PIOMAS is handling the fractures so prevalent this year. When we had the stacked up FYI after the "Ice Hurricane" in late 2011 it melted away with astonishing speed. I have a feeling that though we're losing heat through the fractures, this spring will see even faster ice loss than last year. Wipneus- Yea I've seen that data. It's part of why I came up with my 2007 theory. If the discontinuity is that huge, can you accurately map it in one smooth function? My theory is that even though you have less data it would be more accurate to focus primarily on post-2007 trends. Who wants a smooth function? I think my 'project melt' is quite a good fit for 'melt'. Isn't this more impressive for not being smooth in close to the right places? However, if there were only differences in a couple of places I wouldn't think that, I would instead think overfitting. You can model the freeze volume as 2 horizontal lines or as a smooth curve. Maybe the 2 horizontal lines is a better fit but that doesn't mean it is going to be a better predictor. With the level of noise involved I would be very surprised if the better fit is significant. I suggest that despite the better fit, two horizontal lines is unlikely to be a better predictor if the curve is more physically plausible. I think the curve is more physically plausible. I don't spend any time at all worrying about what is a better fit. I just think about how to look at the data in a way that makes the best predictions. I think it would be a good idea to have an ice prediction contest where people commit to a number and see how well it matches. Of course a lot of it would be luck, but over multiple predictions I think some skill might emerge. Hi Phil. It is a Loess (http://en.wikipedia.org/wiki/Local_regression) curve fitted to the data, it is the default smoothing method for the plotting library (ggplot2) that I used in R to produce the graph. I find the curves are quite useful for trends that are severely non-linear and similar to what an expert human would sketch with graphing paper and pencil. Terry, by all means. I am glad you find the graphs are useful. I wonder how PIOMAS is handling the fractures so prevalent this year. Good question, we don't even know whether the ice in the modeled world of PIOMAS has ice fractures as bad as, or as outstanding as we see on the satellite images now. 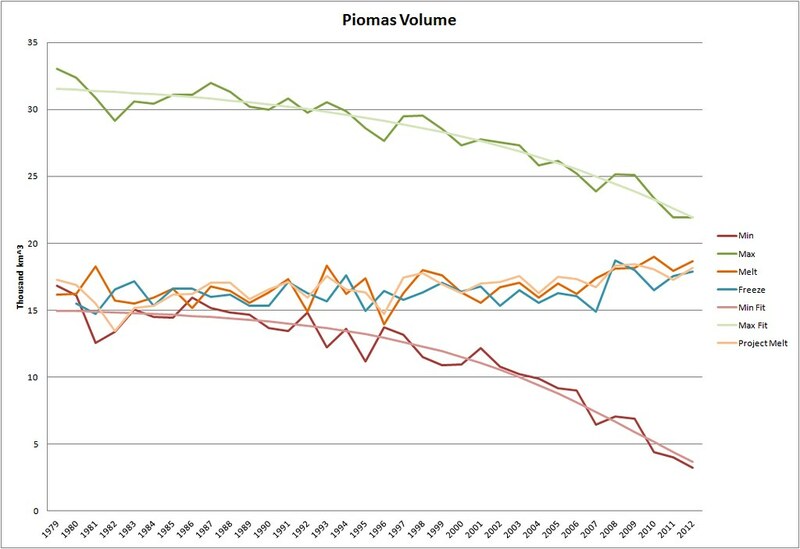 PIOMAS may have been vindicated somewhat, but only as far as the overall annual cycle and long time trends. The details may differ from reality still. Attributing the volume increase mostly to the cracks is IMO jumping conclusions. It also ignores the well known physics that colder than normal temperatures over thinner than normal ice will give larger than normal ice volume growth. Dave, beware. I was taught a long time ago that physical laws are continuous and the world is mostly continuous as well if studied detailed enough. We already know that volume trends are highly non-linear. Human minds are known (for a fact) not to understand exponential trends and falsly introduce discontinuous, sudden, or unexpected behavior when faced with exponential phenomena. Just assuming won't do here to make a convincing argument. PS, attached is trend focused on 2007-2013. I find it makes your case (IIUC ) look even worse. I know that this jump in thickness probably isn't actually all that reassuring, what with it being not only first-year ice but first-year ice that's formed quickly, thus expelling less brine. Nonetheless, I have to say it's somewhat comforting to see the Arctic heading towards the 2013 melt season with a thickness that isn't 1,000 km^3 lower than last year. It won't make a particle of difference to the long-term trend, but as someone who's hoping to get out of the U.S. and into a more northerly country before the ice crumbles completely, every little bit of extra ice is good ice, and every year that the final collapse is delayed is a good year. Wipneus- We use more data points because it gives us more statistical significance and keeps us from unconsciously cherrypicking. But the problem with the arctic is that those data points are not equally valid. Each previous year is less likely to describe the arctic as it actually is today. As I've said, I could be wrong, but it seems that pre-summer 2007 data is describing a different enough situation that you might be better off dealing with the large statistical problems of a small data set. Also, in your graphic you should exclude winter 2006-07 since that was before the divide. Right now I'm just trying to look at the problem from different angles. I'm not in a position to argue authoritatively against your approach, but it seems worth a try to overweight the recent data. At the end of the day it's about what model makes better predictions. A 5 year linear trend is currently predicting 3.35 will be the minimum volume this year. A 10 year linear trend is predicting 3.0. Your exponential trend is predicting 2.0. I certainly don't have everything figured out, but I would be willing to bet that my 5 year prediction is more accurate this year than your exponential model. Wipneus- We use more data points because it gives us more statistical significance and keeps us from unconsciously cherrypicking. But the problem with the arctic is that those data points are not equally valid. Each previous year is less likely to describe the arctic as it actually is today. Hmm. You correctly state mention the advantage of looking at the trends and mention cherrypicking(sic) as a dirty word. Followed by a defending of cherry picked data. All without a single hint of analysis. Repeat: the physical laws that cause the trend are the same in 1980 and in 2013. The behavior is clearly non-linear, so apparent to the human eyes discontinuities are to be expected. I have showed a trend drawn with an algorithm that has been found to be much better than deceiving eyes. cherry picking as you suggest an dropping the 2007 gain, does not change anything at all: 1st of March 2013 data point lies comfortably in the confidence range. You would have known that if instead of eye'ing the graph you would have tried an analysis. Too close to call I think. I'd prefer to say a range of 0 to 4, best value 2. The uncertainty is of course not very satisfying, but that is what the exponential trend method gives. My nonscientific mind thinks your extrapolation might be correct. Every bit of "logic" tells me it is toast.....and PDQ (pretty darn quick) (1) all the positive feedback effects have been kicking in over the past 5 years (2) increasing amounts of CO2 in the atmosphere (3) warm ocean anomaly in the Arctic and north Atlantic (4) early start to Greenland melt season does not bode well for the Arctic was well. So when I "step back from the numbers".....the direction is clear....and the "increasing speed of the direction" is also clear. TOO many things stacked against the Arctic and Greenland as well. One of these years....and this year MAY be the year....the melting in the Arctic and/or Greenland is going to "scare" more "mainstream/average" folks. THAT is what it will take to get some political action....and some substantive change in policy. At this point...most people who visit this board often (which includes me) think the Arctic ice sheet is gone within 2 - 5 years (I think it is summer of 2015 or 2016). Based on a discussion in which I was involved in another forum, I've gone ahead created two new graphs reflecting the same data set in two different manners. These graphs show monthly average PIOMAS sea ice volume from 1980 to now not in terms of absolute volume, but as a percentage of the 1979 value for that month. With data as noisy as they are and no convincing explicit physical model in the background, eyballing the decrease is (imho) as good as any mathematical model can be. Or in other words: extrapolation of any kind holds only under the assumption, that the processes, which lead to this unexpectedly rapid loss, continue more or less the way they did. But on the other hand, a switch to a different weather pattern, leading to, say, more hours of overcast and subsequently less melting, cannot be ruled out. At the end of the day, we are left with a mixture of common sense, guts feeling and fit functions. True, but so far I haven't seen anyone reporting that sunny day overcast is increasing. Overcast after the Sun drops below the horizon should increase melting/water warming as it should trap heat. If the weather (climate) is going to shift to be more favorable to ice retention then is needs to get going. It would seem that if the physics of less ice was going to change the weather pattern then we would be seeing signs by now. Time is certainly of the essence. New graphics in the top post. Great graphs and impressively fast as usual. Thanks you Wipneus! A strange combination? Random fluctuation or to some extent explainable as less ice than last year means more growth than 2012 and more ice than 2011 means less growth than 2011? Thanks as always for excellent work! Wipneus, thanks for the permission for use, I lecture in a week on Climate Change in an ethics course, your graphics will be very helpful. Updated, new graphics in the top post. Great graphs and impressively fast as always. Thanks you Wipneus! So the maximum is slightly less than last two years and the decline since the peak is pretty rapid. Now 0.063 below 2011 and 0.295 below 2012. Wipneus, thanks for all the work you do on those graphs. I find them interesting and informative. I have a question, is this the first time that the projection for Volume includes zero within the error bars? Year 2013 is the first year that has an expected minimum volume with a confidence range that includes zero. I think I did show that for the first time November (maybe December) last year. New this month are error bars around the maximum and a few more dates, responding to a request/question made on the blog. Updated, graphics in the top post. PIOMAS always seems to update after I've gone to bed. Then I have work in the morning. The anomalies are very interesting; looks like this year could break the pattern of the previous three. Thanks very much Wipneus, I always look forward to your monthly ASI volume plots. Of course, that piques our curiosity and raises obvious questions. For more detail, could someone please remind me if PIOMAS now makes available their average thickness values by region or else on a grid? (Or, conceivably, even by parameterisation.) If so, does anyone on this talented blog/forum do thickness maps and also year-to-year thickness difference maps from the PIOMAS data? Thanks, slow wing. PIOMAS thickness is easy to calculate from the gridded data, this can be broken down regionally. However concentration is needed to match the PIOMAS thickness plot and the gridded data are only available monthly. While the PIOMAS team have been good enough to release thickness data earlier this year (updated is normally only annual in January), they have not included concentration. So I cannot calculate thickness. They have provided data for those of us using gridded data to use because it's been noticed what we're doing with it, they have said they will release data again this year. The PIOMAS team are not costed to provide this service to us, so I am unwilling to ask for them to upload concentration as well. As posted over at Neven's blog. I had asked for PIOMAS thickness data to be provided up to July to be available August. In view of current events I am considering asking instead for data up to June to be available in July. Comments on this are welcome here. Chris, you know that we have concentration available since some days allready. Not sure if it is compatible. The PIOMAS concentration is monthly average from the model. The model does assimilate concentration, but this may not necessarily mean that using NSIDC or other concentration is useable to calculate average thickness. That's before you get to mapping your concentration data onto the PIOMAS grid. It looks like a hell of a lot of work for little gain in my opinion. Thanks anyway, and I have been reading with interest (over at Nevens blog) what you guys are up to. It would be very interesting to simply plot the gridded data that the PIOMAS people have given you, normalised to the areas of course, and particularly if the same data is also available for the same time last year so that difference plots can be done. If they provide the ice volumes in grid squares of known area then that indeed provides an average ice thickness for that square and under one definition. (For my tastes, that is probably the most interesting definition as well.) Concentration data is not needed to plot that much. I appreciate your point that they are not paid to provide extra data and are doing it as a favour. It is good of them to do that, and great as well that they have satellite data and other information to work from. Whoever does the plots is standing on the shoulders of many hard working scientists. I have previously done interannual and intermonth thickness but I'll have to dig the url out of an email as it's not in my favourites. I've not updated this for 2012 and 2013. Also gridded thickness data did update. @Wipneus - Unless I'm missing something, looks mostly like a 'wash' in terms of over-all volume. Key difference I'd say would be the thinning at higher latitudes, which ( I presume...) is the source of MYI going forward. All in all though, seems like large amounts of ice are being spun out of the central arctic basin, much as a centrifuge forces anything heavy to the bottom of the tubes it spins. That may not work out so well for ice in the Beaufort, even if we don't see as dramatic an early melt out. Thanks, Wipneus, for that PIOMAS difference map! Agreed, jdallen, the ice has thinned from last year in the middle. The overall volume looks similar* because that is approximately compensated by thicker ice on average around the fringes, where most of it would generally be expected to melt away anyway. Thick ice in Chukchi and East Siberian Sea. The maps of the gridded data are monthly averages. To put it in more mechanistic terms. The further south the ice edge is relative to the current pseudo-equilibrium (has 2012 set a new lower equilibrium point? ), the more insolation it will be subjected to, and a faster volume loss should be expected to occur. The further south ... the more insolation it will be subjected to. Yup, insolation along with warm Pacific and Atlantic waters (and, possibly, churned-up salty & warm Arctic water) working on the Persistent Arctic Storm mélange (slush puppy ice left by the churning winds) plus any other special (weather) effects Ægir and Rán (too far north for Poseidon) choose to throw down this year, including forced migration of ice through the Fram. Is that TOA or surface, adjusted for angle of incidence? Thanks Wipneus, I wasn't aware of it. The figures you have are in line with radiometer figures from a 1993 cruise off Siberia.